Ritemaster Iachesis was the leader of the Psijic Order, a long-standing monastic group of mages dedicated to studying the Old Ways. He was widely considered one of the wisest and most powerful mages in history, and led the Order for at least three and a half millennia. 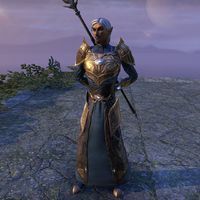 Iachesis is known to have been the head of the Psijic Order as early as 1E 20, when the mage Voernet went to the Isle of Artaeum to meet with him. Around that period, the Psijics served as counselors to kings of Summerset and proponents of "The Elder Way", though the Order later chose to take more neutral approach to world affairs. In 1E 2920, Sotha Sil and Almalexia were recorded as having met with Iachesis after the signing of the Coldharbour Compact. In the early Second Era, former Psijic sage Heliand brought a young 11-year-old boy named Trechtus to Iachesis. He recognized the young boy's potential and welcomed him into the Order, bestowing the name "Vanus Galerion" on his new pupil. Many years later, Galerion became disillusioned with Iachesis and the Psijics when they exiled the aspiring necromancer Mannimarco instead of imprisoning him. Iachesis was one of the people Galerion had to answer to when he began collecting mages from all over Summerset Isle to form the new Mages Guild, which he eventually did after leaving Artaeum and the Psijic Order for good. Shortly after the founding of the guild in 2E 230, Iachesis fought a group of four Sea Sloads known as the Abyssal Cabal, whose goal was to sink the Summerset Isle and claim it for the Sea Sload underwater kingdom of Ul'vor Kus. One of the members of the Cabal, K'Tora, managed to overpower the Ritemaster with his mind magic, and made him steal the Heart of the Transparent Law, the central part of the Stone of the Crystal Tower. Then he altered Iachesis' memories so he would remember defeating and killing K'Tora instead. However, Iachesis was able to partially resist K'Tora's magic, and desperate to keep the Heart out of the Sea Sload's hands, he accepted Nocturnal's offer to help. The Daedric Prince called Iachesis to Evergloam, where she taught him a spell to hide the crystal, and declared that without a special passphrase—in a language only mortals could use—no one would be able to find the Heart, not even Iachesis himself; he then hid the Heart within himself, unbeknownst to Nocturnal. The Ritemaster forgot the whole event when the deed was done. With what was left of his free will, he was able to remove Artaeum from Nirn, out of the Cabal's influence. This freed him from K'Tora's control, but his memories remained altered. Around 2E 583, the Cabal returned to the Summerset Isle, allied with the Court of Bedlam, an alliance of worshippers of Nocturnal, Mephala, and Clavicus Vile, who themselves formed an alliance called the Triad. After the agents of the Court managed to locate Artaeum by kidnapping the Oracle of the Wyrd, K'Tora used the power of Abyssal Pearls to invade the Psijic island and attempted to pry the location of the Heart of Transparent Law from Iachesis' mind, but was stopped and killed by the Soulless One. Afterwards, Iachesis gradually regained his memories, and soon found himself with the Soulless One, the fellow Psijic Valsirenn, and Meridia's champion Darien Gautier in Evergloam, where the group attempted to learn where Iachesis had hidden the Heart. When they reached the ritual site and learned that the Heart was inside Iachesis' body, Mephala and Clavicus Vile appeared and tried to retrieve the crystal. They were interrupted by Nocturnal, who betrayed them, banished them from her realm, and tore the Heart from Iachesis' body, killing him. Nocturnal planned to use the Heart to gain control of the Crystal Tower and use it to spread her influence to every possible reality. Her plot was ultimately foiled by the Soulless One with the aid of Mephala and Vile, and Valsirenn became the temporary Ritemaster of the Psijic Order. Artaeum returned to Tamriel some one hundred and fifty years later, but the Psijics would not, or could not, offer any explanation as to where the Isle had gone or for what happened to Iachesis. 1. The events of The Wolf Queen involving Iachesis take place in the early Third Era, long after Iachesis' death, but before Loremaster Celarus took leadership of the Order. It was most likely an oversight that Iachesis was featured in this series. As the Ritemaster, Iachesis' mascot was a psijic bear cub. This page was last modified on 20 January 2019, at 22:55.